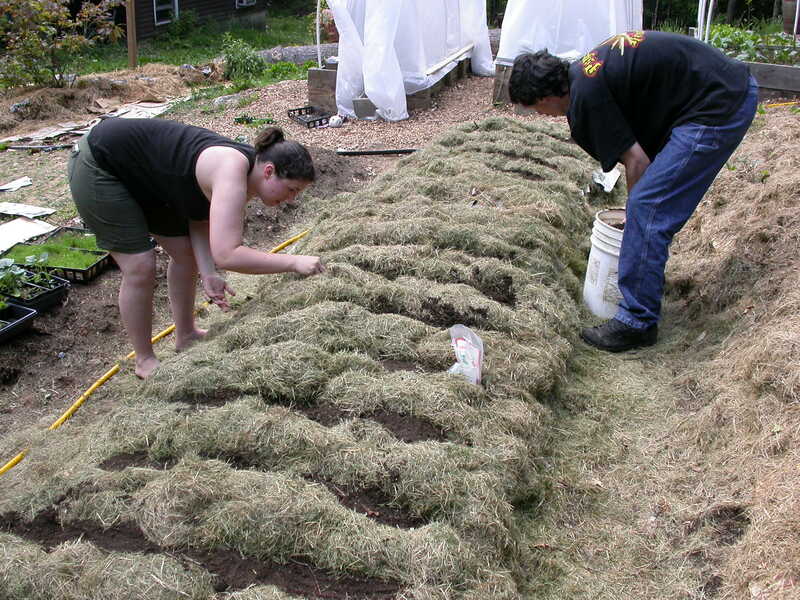 …Sheet Mulching, Permaculture, Composting in Place, French Intensive or Biodynamic Gardening) Whew! So many names, such a simple idea! For our October meeting, Dot Perkins, Educational Program Coordinator for Agriculture Resources at the UNH Cooperative Extension, came to talk to us about “No Till Gardening”. This past season, she used her own back yard as a laboratory to experiment with all the different methods of creating garden beds without using a rototiller. She started with a gravel driveway and a cement pad and ended up with a “Garden of Eden” by the end of the season. It was quite amazing! She generously shared her preferred method with our group. The difference between her method and others is that she mixes up all of the layers before ending with a top layer of newspaper and mulch. In permaculture, sheet mulching is an agricultural no-dig gardening technique that attempts to mimic natural processes occurring in forests. When deployed properly and in combination with other permacultural principles, it can generate healthy, productive and low maintenance ecosystems. The beginning: Gravel and dirt. 1. If you are starting on top of grass, put down a layer of cardboard or thick layer of newspapers. 2. Then layer on top about 10 inches of compostable materials all mixed together. 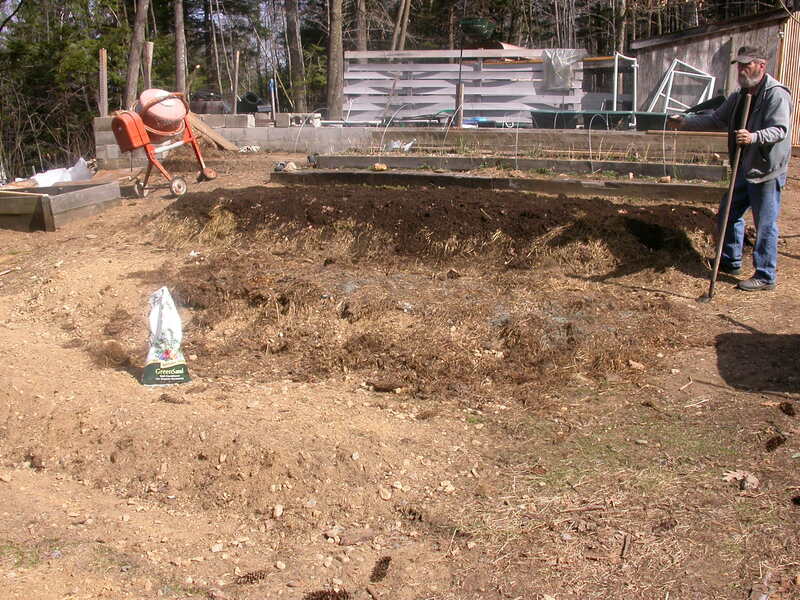 The materials will compost down on top of your garden beds. Use approximately 3-4 inches of green (manure, animal bedding, grass clippings, chopped green plant/vegetable material) to 6 inches of brown (chopped up leaves are best). You can add in some green sand and bone meal according to the directions on the box. Mix it all together on top of your bed. 3. If you have finished compost on hand. Layer on top. If not, continue to #4. 5. Finish with a layer of mulch. Chopped up leaves are best, but you can also use grass clippings or straw (not hay!). 6. Water well. If it is fall, you are DONE! Go relax with a beverage of your choice! 7. If it is early spring, you will have to “cook” the beds so that they compost down quickly and will be ready to plant in the late spring. Cover the beds with black plastic for at least six weeks, so plan accordingly. NOW you can go and relax for awhile! After six weeks, remove the plastic. Your beds should be well composted and ready to plant. Beds are finished. Push aside grass clipping to plant seeds or seedlings. 1. When it is time to plant, top dress your beds with a layer of grass clippings. The grass clippings will provide an additional source of nitrogen, keep in moisture and prevent weeds. 2. Push grass clippings aside and plant directly into the compost. Raised beds don't need wooden sides. The young plants are doing beautifully in their new beds. When your beds are done for the season, remove any diseased plant material and dispose. Do not compost. For healthy plants, leave the roots in the ground to decompose and chop up the tops to add back on top of your soil as green material. You can again put on another layer of plant materials using about 2 parts green to 3 parts brown all mixed together. Top again with newspaper and mulch. Then, in the spring, add on another layer of grass clippings and plant. By doing this every year, you will continue to grow the fertility of your soil. Dot used baby chickens and turkeys that she raises for meat in her garden for pest control. She would let them roam around the garden until they were about 6 weeks old at which time, they started becoming destructive to the plants and she would remove them to the coop. By letting the baby chicks free range in the garden, they ate all of the insect pests. Dot also was very diligent about picking off plant diseases and disposing of the material as soon as she would see a problem. She was very careful to keep her garden tools clean and sanitized so that she didn’t spread plant diseases throughout the garden. She used antibacterial baby wipes to keep things clean. While not all of us have access to baby chicks for insect control, we all could be more careful keeping our tools clean and keeping an good eye on our plants to nip diseases in the bud before they get out of control. That is just part of being a good organic gardener. It’s late autumn and if you haven’t done it already, it is time to put your garden to bed for the winter. Sad but true. Winter will be here before you know it so it’s time to get to work! Some of us still have food in the garden. Right now, you may have cold weather crops like kale, radishes, greens, broccoli, brussel sprouts, chard, mint, herbs and root veggies like carrots going strong. You can leave those alone or cover them with Remay to extend the harvest. Clean up those beds next spring. As for the rest, it’s best to clean up any diseased plants and get them out of the garden first. This year, throw away tomato and potato plants…even if they didn’t get the late blight. Clean out those beds really well and DO NOT COMPOST! 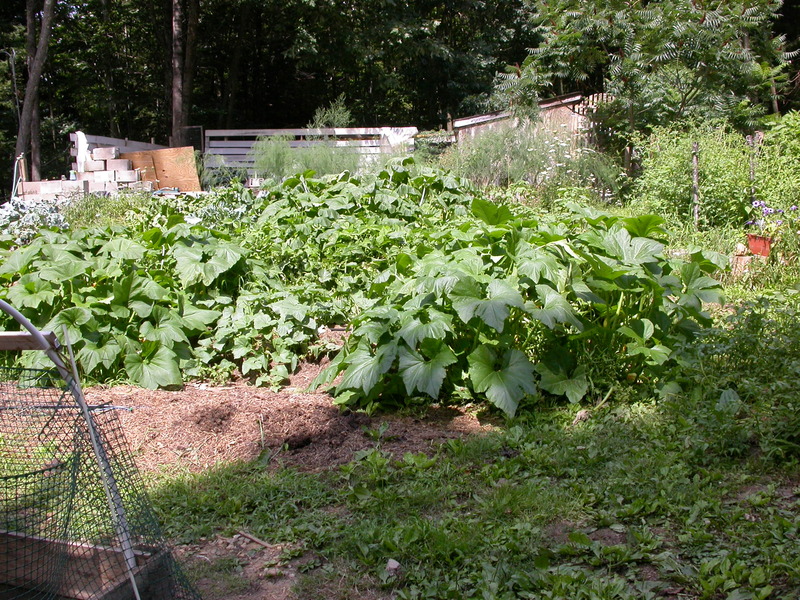 It’s also a good idea not to compost anything that got powdery mildew like your squash vines, cucumbers, etc. Bust out those purple bags and toss it all! Your garden will be happier in the long run. The next plan of action is to cut down all of the dead plants. If the plants were healthy, leave the roots in the ground. They will compost in the ground, nourish the soil and prevent soil erosion. Now is the time to send in your soil samples. You might be able to add amendments to the soil before winter. If not, you’ll be all set for next spring. The last step is to mulch your garden beds to prevent soil erosion. Chopped up leaves are the best. Rake your leaves into piles, chop them up with the lawn mower and put them on the garden beds. Maple and birch leaves are ideal. Avoid oak leaves. If you don’t have leaves, I’ll bet a neighbor would be willing to give you some! Failing a friendly neighbor, grass clippings or straw will work as well. Add in some manure if you can get it. 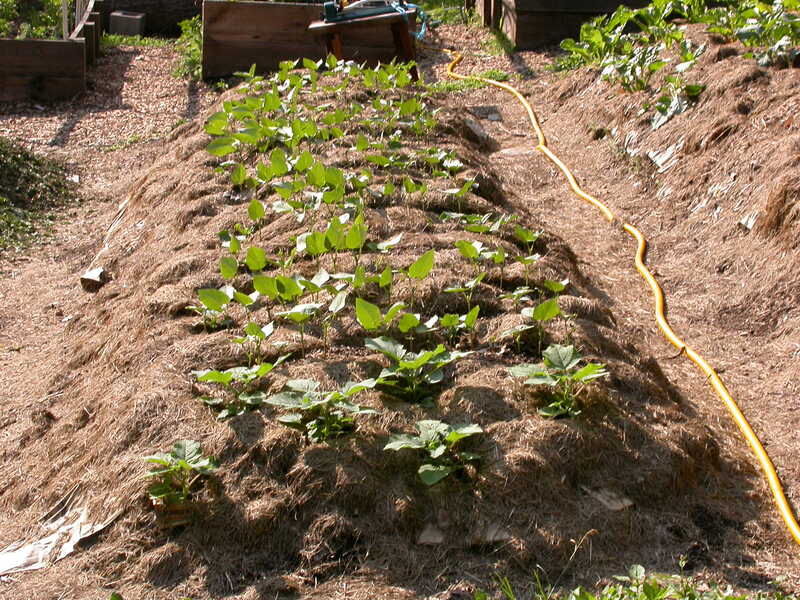 The idea is to prevent soil erosion and the decaying mulch will also add nutrients to your soil. As those first snowflakes begin to fall, bring in all of your hoses and garden “flotsum” like clay pots, tomato cages, etc. Take some time to clean up your storage area and make it all nice and clean for next spring! Think of the joy you will experience on that first lovely spring day when you waltz into your clean, well organized storage area and can actually locate a shovel for planting your peas! Ahhhhh! For more information about soil testing, contact the UNH Cooperative Extension.